If your pond has frogs, toads, newts or ducks they all love eating slugs as part of their natural diet, so are a great aid in combating slugs. Toads in particular are nocturnal feeders and can eat huge amounts of slugs during the course of just one night. It goes without saying that if they eat slugs that have been treated with slug pellets you will not only kill the toads, frogs, newts and ducks but you will also give them a terrible death. Slug pellets always kill more than their intended target, so anything that enjoys eating slugs such as hedgehogs and birds will also suffer the same fate. Slugs can easily climb up into raised ponds and water features, so when slugs that have been treated with pellets fall into the water they kill the beneficial life within the pond which has a devastating effect upon the natural balance of the pond. Algae and blanket weed quickly take advantage of the unbalanced conditions and thrive. We at Aquaplancton urge the natural approach. 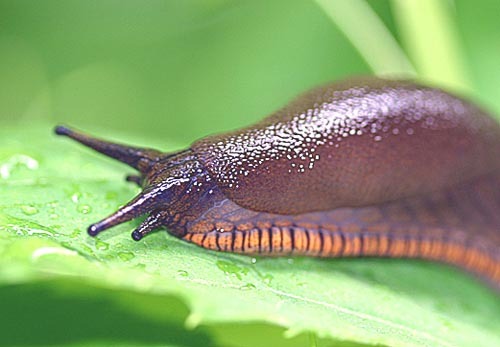 Slugs hate crawling over rough surfaces, so you can create a friendly barrier by surrounding your plants with gravel, crushed egg shells, sawdust or even used coffee grounds. Coffee grounds not only deter slugs, but at the same time they nourish the plants, particularly roses. 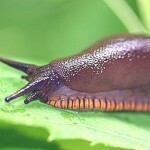 Slugs also hate sliding over slippery surfaces, so strips of copper can be glued around the rims of plant pots to deter them from attacking patio plants. Another environmentally friendly approach is to sink margarine tubs into the ground, pour in a little fresh beer (not the stale dregs) and they will soon be full of slugs that have met a blissfully inebriated end. We hope that we have deterred you from using slug pellets, but if we have failed, then please don’t apply them too close to a pond because they can get washed in when it rains causing death to beneficial life and only apply slug pellets when the weather is dry and no rain is forecast. This entry was posted in Techniques and tagged frogs, Plants, Pond, slug pellets. Bookmark the permalink.